Here are a couple of shows that we have coming up this weekend. 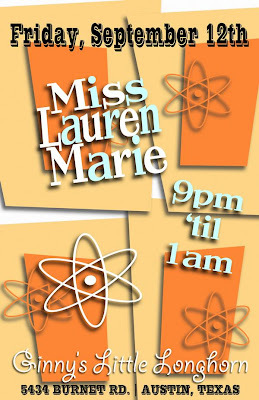 On Friday, September 12th, we will be backing up Miss Lauren Marie at Ginny's Little Longhorn on Burnet Rd. here in Austin. Nick Curran will also be playing guitar with us on this show. Then Saturday night--barring that we still have power after Hurrican Ike--we'll be over at Waterloo Icehouse. Dave Biller will be pickin' with us that night. It's been awhile since Dave's played with us and we're really looking forward havin' him along. PS--If you like either of the posters, I designed them.